NORCROSS, Ga. — Richard Coleman, senior director of mobilization and candidacy for The Mission Society (www.themissionsociety.org), was recently selected by Frontier Ventures (www.frontierventures.org) to present six short lectures for Perspectives on the World Christian Movement (www.perspectives.org) at the Grammy Museum’s Clive Davis Theatre in Los Angeles. Frontier Ventures will use Coleman’s contribution for a newly revised online and DVD format of the Perspectives course. 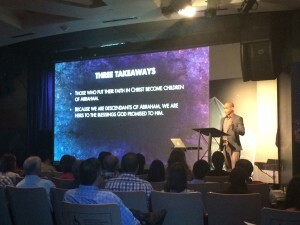 Coleman presented three modules in each of two lessons, “The Living God is a Missionary God” and “World Christian Partnership.” He co-taught with other instructors including Claude Hickman, a former BMX pro (Lesson 1) and Bryan Padgett, pastor of Redeemer Church in Stillwater, Okla., (Lesson 15). Since 1974, more than 200,000 students have taken Perspectives’ 15-week course either online or via DVD to learn about God’s redemptive work among “every tribe, tongue and nation.” The course includes the biblical, historical, cultural and strategic dimensions of God’s purpose. The creation of the online and DVD format will make this course more accessible to people worldwide. The Mission Society equips, sends and cares for missionaries worldwide. Coleman leads The Mission Society’s recruiting and candidate screening efforts. He also helps mobilize churches, especially African-American churches, for missions. This was his sixth year serving as a Perspectives instructor, a role he has assumed outside of his responsibilities with The Mission Society. Coleman’s introduction to missions began in 1998 with a seven-week trip to Uganda while he was a student at Oral Roberts University in Tulsa, Okla., where he completed Bachelor of Arts in Biblical Literature and Masters of Divinity degrees. He later served a metro-Atlanta mega-church as its director of missions. While there, he taught missions classes, supported missionaries, and led short-term trips to places such as Kenya, Nova Scotia, and Honduras. Coleman previously contributed articles to Evangelical Missions Quarterly, Seedbed and The Mission Society’s Unfinished. Founded in 1984 in the Wesleyan tradition, The Mission Society (www.themissionsociety.org) exists to mobilize and deploy the body of Christ globally to join Jesus in His mission, especially among the least-reached peoples. The Mission Society recruits, trains and sends Christian missionaries to minister around the world. Its church ministry department provides seminars, workshops and mentoring for congregations in the United States and abroad, helping equip churches for outreach in their communities and worldwide. At present, The Mission Society has 225 missionaries serving in 35 countries. Frontier Ventures recently selected The Missions Society’s Richard Coleman to present lectures for a video shoot of the new Perspectives on the World Christian Movement course.